Lochdubh, remotely nestling in the Highlands, is perfectly anonymous... until well-known TV reporter Crystal French races into town in her bright new BMW. And PC Hamish Macbeth, dourly wed to duty rather than the fiancée who dumped him, promptly gives her a ticket for reckless driving. 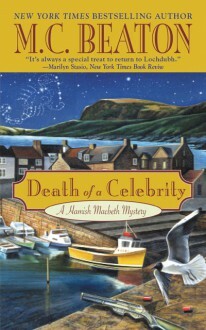 Outraged, Crystal makes Macbeth's life a misery with a TV report on policing in the Highlands... but when she also rakes up old local scandals for her new hit show, Macbeth notes that someone besides himself might be dead keen to stop her. And then someone does. Not my usual read as I don't much care for British mysteries of this type. Read this one since she was the author of the month for my "cozy" group. An okay read, though I won't rush to read more. Better than some I've read, worse than others. Actually a solid 2.5 stars rating.